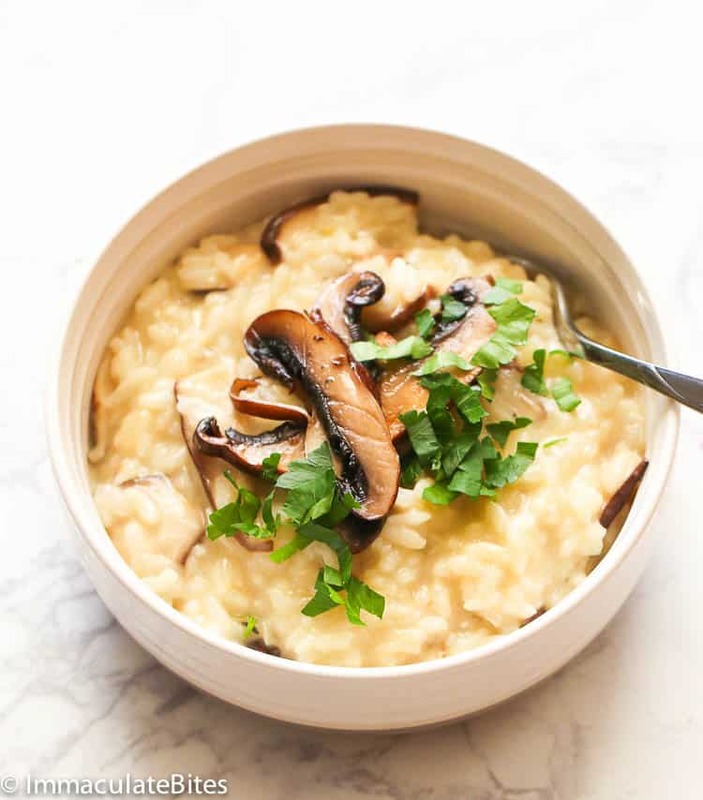 Mushroom Risotto – a creamy, very comforting rice dish made with arborio rice slowly simmered in a flavorful chicken stock layered with smokey, cheesy flavors. Great as a side dish or a meal on its own. As they would always, “You’ll reap what you sow”. Cooking a risotto somehow requires your undivided attention to be rewarded with such a comforting dish. It’s so delicious that I had to stop myself from diving right into a hot pot of Mushroom Risotto. And I recall eating a big bowl of warm risotto for breakfast 3 days in a row. Yes! It’s a rice dish on a next level. If you like Jollof Rice or Mexican Rice, then no doubt you’ll fall head over heels with this rice dish from Northern Italy. It’s cooked in a vegetable or chicken broth until it becomes rich and creamy. Other than that, it is usually added with butter, onions, white wine and Parmesan cheese for a full-flavored dish. This dish doesn’t need any cream though to achieve its consistency, but rather, it comes from the starches found in the grains that are released as it is constantly stirred while gradually pouring the stock a little at a time. Adding freshly grated Parmesan also contributes to that silky smooth creaminess, too. What is the Difference Between Risotto and Rice? At first thought, you would think that there’s hardly any difference between a risotto and with other rice dishes. Seriously, when it comes to rice – baked, stovetop, fried rice – they’re all the same, to me. They are equally comforting; speaking from a huuugee rice lover’s perspective. 😀 But after a couple of tries, I’m pretty convinced that THAT creaminess is the bar that separates it from the rest. Unlike the regular cooked rice, a risotto requires your undivided attention and constant stirring (think of the traditional Jollof rice). Moreover, among all those other famous rice dishes, risotto has almost twice as much ratio between rice and liquid, making it “THE” creamy one. It also helps that it uses a special starchy rice to achieve that creamy consistency. If you’re a fan of washing your regular rice before cooking (which I do), here in a risotto recipe, you won’t need to do that. Rinsing or parboiling the rice will actually remove the starch needed for its creamy texture. So yeah, leave that rice that way. You can throw in whatever proteins or vegetables you want into this dish, but Mushroom Risotto is the crowd-favorite by far. What is the Best Rice For Risotto? While I do get tons of questions if they can substitute the rice with this and that for my other rice recipes, unfortunately my friends, this Mushroom Risotto has only few choices. Achieving that rich, elegant, velvety creamy texture all lies in the type of rice you use for this recipe. In a bigger scope, short to medium-grain in size, plump and with high starch content are the criteria for finding a great risotto rice. These type of rice holds up pretty well with the constant stirring. They are usually labeled as risotto rice in most grocery stores. For this Mushroom Risottto recipe, I used a medium-grain arborio rice that is widely-available and easy to cook with. But be careful though, this type of rice gets overcooked and mushy so easily. 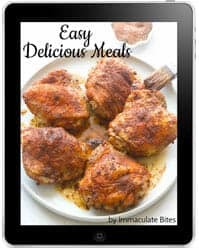 So that also means that basmati or jasmine rice won’t take the cut in this recipe because of their low-starch content. Other than arborio rice, you can make a perfect risotto with carnaroli (chefs’ top pick), vialone nano and other harder-to-find types like baldo, cal riso and maratelli. What To Serve With Mushroom Risotto? 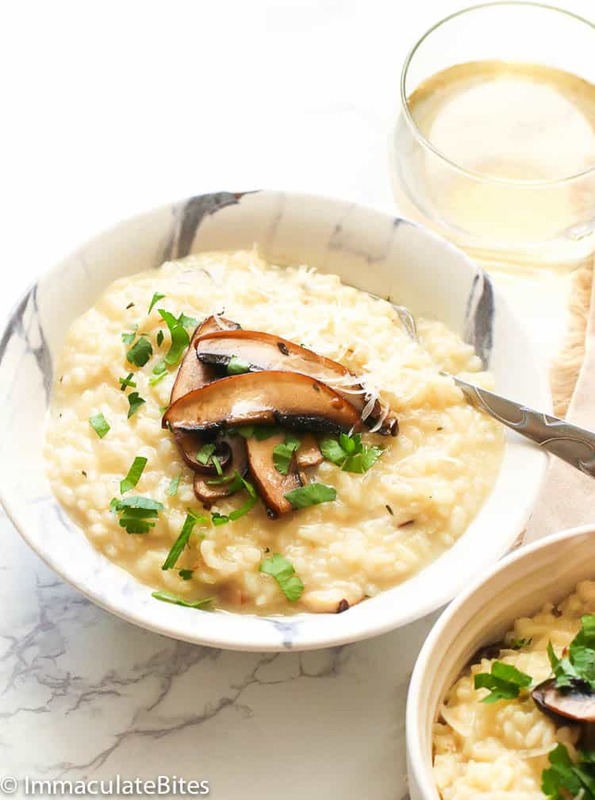 Honestly, with smokey slices of shitake mushrooms between each spoonful of creamy risotto, I don’t think you need an accompaniment for this dish. It’s soooo darn good on its own – either for breakfast (like a porridge) or for dinner. But if you want a full hearty meal, this Mushroom Risotto can be served with fish, roasted veggies or any greens at all. I’ve recently tried it with this Pan Seared Oven Roasted Steak and it was the bomb! A very important reminder though: Make sure to use a warm stock when making this recipe and DO NOT add the stock too quickly or else you’ll just end up boiling a rice. 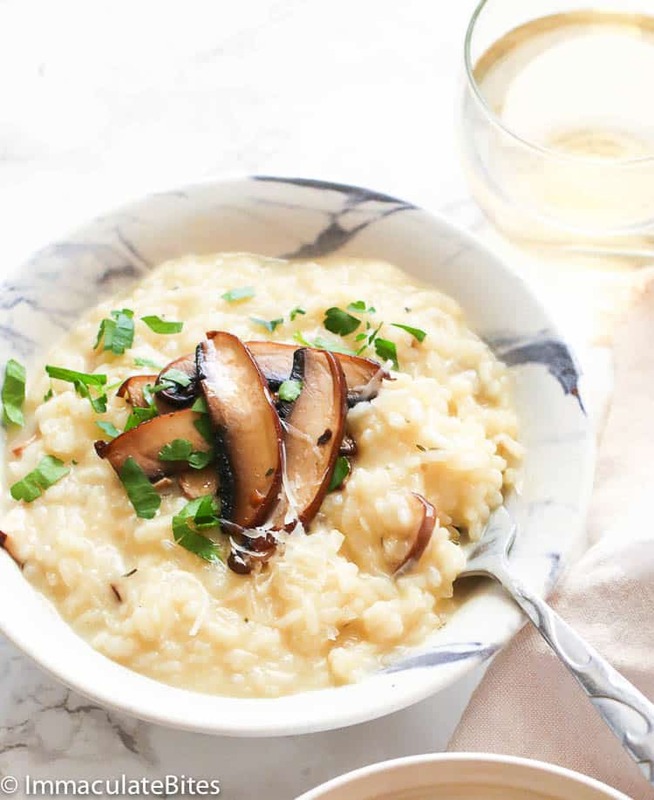 For this type of risotto, I prefer using Portobello or Shitake mushrooms as they both have an intense smokey flavor which enhances the recipe. Also the texture of portobello mushroom is comparable to meat, so it’s like tossing in some bits of meat into this creamy rice dish. Be mindful of the stock’s salt content used in this recipe. If you want to err on the safe side, use a low-sodium chicken or vegetable stock and adjust the taste as you go along. Use a freshly grated Parmesan cheese as it melts easily and has better flavor compared to those pre-shredded packs. Do not add the stock all at once as we want the rice to slowly absorbed that stock to create that perfect creaminess. Store any leftover risotto in an airtight container and place in the fridge for up to 5 days. If it contains any meat, 3 days would be the max. Risotto is best enjoyed when served right off the pot; avoid freezing or making it ahead. 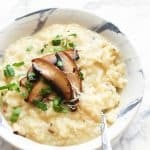 Mushroom Risotto - a creamy, very comforting rice dish made with arborio rice slowly simmered in a flavorful chicken stock layered with smokey, cheesy flavors. Great as a side dish or a meal on its own. Start by heating up a pot with stock, bring to a boil and turn stove off. Add butter in a large saucepan over medium heat. Let it melt, then add olive oil. Let it simmer. Next add onions,, garlic, thyme and saute until onions are translucent and tender - about 4-6 minutes. Throw in mushrooms and bay leaf. Cook; stirring occasionally until the mushrooms have cooked down. Stir in rice and mix until mushroom is fully combined with rice and slightly toasted - about 1-2 minutes. Pour in wine and continue stirring until the wine has evaporated. Start adding stock; starting with a cup at a time, stirring frequently until stock is fully absorbed before proceeding with the next cup. Repeat above's step; simmering over medium heat until you have used up about 5-6 cups of stock. Rice should be just tender and the mixture is creamy. This might take about 18- 20 minutes or maybe more, depending on how quickly the rice cooks. Once the rice is al dente (rice should be slightly firm when bitten) remove from the heat. Add Parmesan and stir to combine. Season with salt and pepper. Serve and top with parsley and extra Parmesan, if desired. 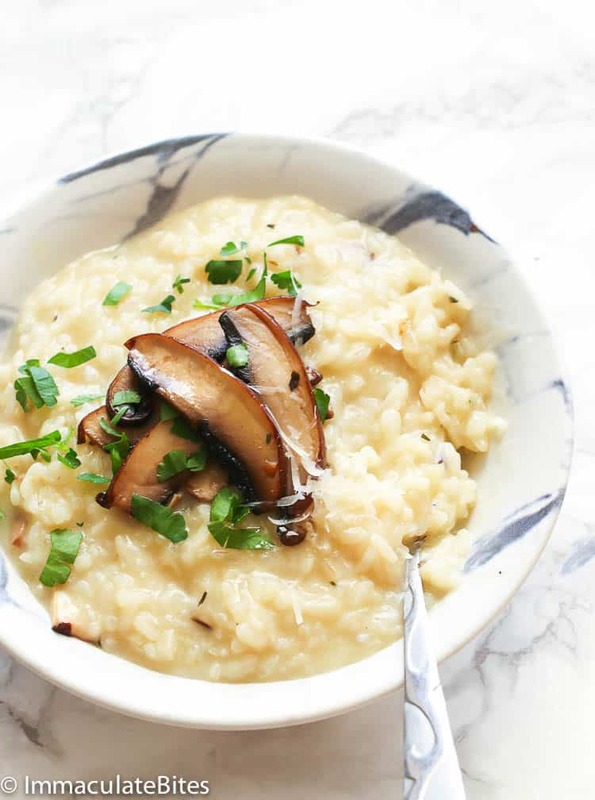 For this type of risotto, I prefer using Portobello or Shitake mushrooms as they both have an intense smokey flavor which enhances the recipe. Also the texture of portobello mushroom is comparable to meat, so it's like tossing in some bits of meat into this creamy rice dish. Be mindful of the stock's salt content used in this recipe. If you want to err on the safe side, use a low-sodium chicken or vegetable stock and adjust the taste as you go along. Store any leftover risotto in an airtight container and place in the fridge for up to 5 days. If it contains any meat, 3 days would be the max. Risotto is best enjoyed when served right off the pot; avoid freezing or making it ahead. Start by heating up a pot with stock, bring to a boil and turn stove off. Add butter in a large saucepan over medium heat. Let it melt, then add olive oil. Let it simmer. Next add onions,, garlic, thyme and saute until onions are translucent and tender – about 4-6 minutes. Throw in mushrooms. And then the bay leaf. Cook; stirring occasionally until the mushrooms have cooked down. Stir in rice and mix until mushroom is fully combined with rice and slightly toasted – about 1-2 minutes. Start adding stock; starting with a cup at a time, stirring frequently until stock is fully absorbed before proceeding with the next cup. Repeat above’s step; simmering over medium heat until you have used up about 5-6 cups of stock. Rice should be just tender and the mixture is creamy. This might take about 18- 20 minutes or maybe more, depending on how quickly the rice cooks. Once the rice is al dente (rice should be slightly firm when bitten) remove from the heat. Add Parmesan and stir to combine. Season with salt and pepper. Serve and top with parsley and extra Parmesan, if desired. Thank you for this recipe. I looks delicious and I have no doubt it is! I’m headed out now to get my ingredients and will definitely post my results! Awesome! Can’t wait to hear feedback!